Nelson Mandela is dead. Thus ends an epoch in the revolutionary history of the South African people. The generation which included Mandela, Walter Sisulu, Olver Tambo, Alfred Nzo, Govan Mbeki, Ahmad Karthdra Dennis Goldberg and others assumed the stage of history from within the ranks of the ANC Youth League in the mid-1940’s. Sisulu and Tambo were Mandela’s closest comrades and his political and intellectual mentors. Mandela’s life is, finally, a lens through which to understand the South African struggle. Rather than a single line, his life proceeded through stages and contradictions. Since radical politics starts with concrete analysis of concrete situations, we are compelled to study Mandel as a living human being in a concrete epoch of history. To do this we must study the stages of his life, how his consciousness evolved, and actualized in his organizational and ideological activity and most importantly how he emerged as a revolutionary committing himself completely to the liberation of black South Africans and to Africans generally. We must also forthrightly address those contradictions in his development that produced the weakening and finally the abandonment of his revolutionary resolve. This essay does not propose to tackle all of the question concerning Mandela’s biography, but will attempt to establish a context for understanding them. Western capitalist, presidents, prime ministers, politicians, religious leaders and elite intellectuals are bestowing upon Mandela praise and celebration and speak of him in language seldom used in reference to presidents, popes, royalty or leaders of finance and industry. The very ones who supported his jailers, and for over one hundred years the oppression of the South African people, hypocritically anoint him one of the “greatest men of the 20th century”.This rank hypocrisy must not obscure our duty to seek out the truth of Mandela’s life as part of understanding the struggles that lie ahead both in South Africa and the US. There are essentially four stages in Mandela’s life. The first stage 1918–1943. He is born in 1918 to an aristocratic Xhosa family in a South Africa colonized by the English and Dutch settlers. By 1943 he completed his university education. In this period he does not foresee an activist future, let alone a revolutionary one for himself. The second stage, 1943 to 1960. This is the period when his revolutionary consciousness takes form. He comes into contact with revolutionary intellectuals who help form his understanding of organization, ideology and how to connect radical ideas to mass protest. This period ends with the Sharpeville Massacre in March 1960. During this time Mandela and his colleagues in the ANC and the South African Communist Party are indicted by the racist regime in 1956 for treason. Also the ANC, now under the leadership of Walter Sisulu, produces “The Freedom Charter”, which sets forth a radical and socialist program for the people. With the Sharpeville Massacre the third stage of Mandela’s life begins. The third stage, 1960—1990.This is perhaps Mandela’s most revolutionary period. The ANC and its ally in the struggle the South African Communist Party conclude that the regime will not relent and has decided to crush the people’s movement by force. They insisted the regime had become fascist, closing all doors to a peaceful and democratic transition to majority rule. It is with this evaluation that the ANC and the South African Communist Party (SACP) decide to form the military wing of the liberation movement Umkhonto we Sizwe(MK)—The Spear of the Nation. The formation of the armed wing begins in earnest the decisive battle for freedom. The armed struggle lasts 30 years and along with mass uprisings eventually broke the back of the regime. Mandela and 19 of his comrades were captured on July 11, 1963 in a farmhouse in a small town named Rivonia, outside of Johannesburg. He and nine of those captured were put on trial and convicted of high treason and sentenced to life in prison on Robben Island. Mandela serves 18 years on Robben Island and almost nine in Pollsmoor Prison and eventually under a form of house arrest in a villa outside of Capetown. While on Robben Island Mandela Sisulu, Govan Mbeki, Ahmad Kathrada, and others would constitute a high command of the revolution. Driven underground the ANC establishes an external wing headed by Oliver Tambo. It is this external wing that built international support for the movement, as well as directing underground activity within the country. At the same time MK remained active carrying out low level sabotage against the regime, setting up external bases in neighboring African nations, building international support and training young militants and recruiting cadre from within the country. The Western nations under the guise of fighting communism and terrorism embraced the regime, propping it up militarily and financially. Over 300 US corporations and banks had investments and loans in South Africa. Five hundred British corporations and a significant number from France, West Germany, the Netherlands, Belgium and others made up the foundation of the apartheid economy. The World Bank and the IMF loaned tens of billions of dollars to the regime to finance both its foreign trade and police and military. They thrived off super exploited black labor in mines, farms and factories. The military alliance between the US, Britain, Israel and South Africa would supply advanced weaponry and eventually nuclear technology to the white regime. The fourth stage 1991—2013. This stage begins with his release in 1990 from prison. This stage is the most contradictory and problematic. Upon being released from prison he proclaims himself to be a disciplined and committed member of the ANC, bound by its collective decisions. He affirms his solidarity and gratitude to the ANC and South African people’s allies, including Fidel Castro, Yasser Arafat and Muamar Gaddafi. However, by 1994 when the first democratic elections are held and he elected President, Mandela’s revolutionary resolve had weakened and rather than an economic program based upon the Freedom Charter and the radical redistribution of wealth and income, a program of neoliberal capitalism and protection of western corporate wealth and white south African interests is implemented. In return blacks got the right to vote, a vague commitment to affirmative action, and modest improvements in the lives of the poor through electrifying some townships and rural areas and the provision of clean running water. The system of super exploited black labor remained in place. Poverty would increase under the new government. While political apartheid ended economic apartheid in a different guise took shape. With the exception of a few black multi millionaires and a small black middle class of professionals and government workers the suffering of working masses and poor has become more desperate. The poor in the end became poorer and the inequalities in the nation are now greater than at the time Mandela was elected, among the worse in the world . It is clear, for most of his life as an activist and icon of his people’s movement Mandela was a revolutionary. From the mid 1940’s until 1990 he thought and acted as a revolutionary. After 1990 he takes a different course, which ends in him being embraced by the global forces of counterrevolution; in fact the enemies of the people he fought so valiantly and selflessly for. 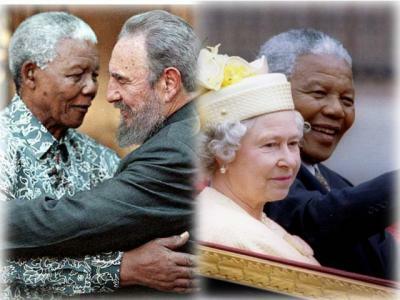 It is Mandela as a ally and representatives of western imperialism and neo-colonialism that the media will highlight in the praise and memorializing of Mandela. They will claim him as a savior of capitalism and white interests in South Africa. For them he protected western and white interests, especially the vast mineral resources and cheap labor, not just of South Africa, but of southern Africa, the world’s mineral treasure house. There are six events, which turn Mandela, the majority of the ANC , SACP and the Congress of South African Trade Unions (COSATU)—what is known as the revolutionary alliance– against itself , setting the stage for the undermining of the revolutionary trajectory of the movement. In the end the ANC government became a neo-liberal capitalist regime , upholding a neo-liberal capitalist program. First Mandela’s decision in the late 1980’s to, in violation of ANC discipline, begin secrete negotiations with the regime. This is a very critical moment. This occurs at the same time a great, and as it turns out, decisive uprising takes place in South Africa. The people take on the military and police and in pitch street battles defeat them and their black stooges, thereby liberating townships and Bantustans. The epicenters of these battles were the townships of Soweto and Alexandra, and their personification was the heroic Winnie Mandela. Townships became liberated zones. MK was active in training a new generation of fighters and funneling weapons to them. In 1987/1988 the South African army invaded southern Angola and was defeated at the great battle of Cuito Cuanavale. A combined force of the Angolan army, Cuban volunteers, and MK fighters emerged victorious. In the wake of these victories inside South Africa and Angola the regime and its Western backers, led by the US, sought a truce in order to save what they could of Western interests and the white minority from possible physical elimination. To begin genuine negotiations the regime is forced to free Nelson Mandela and all political prisoners, to unban the ANC, COSATU, the Pan Africanist Congress and the South African Community Party. Second, the ANC agrees to assume responsibility for the debt accumulate by the white regime and took an IMF loan to cover it in 1993. The loan is estimated to have been $25 billion. This large loan included secret ‘conditionalities’ that ensured that a democratic South Africa would not waver in paying off the regime’s debt, most of which was accumulated to pay for its repression and murder of African people. The IMF made sure a black government would inherited undemocratic economic policies, as well as informal conditions that the the ANC government retain the apartheid regime’s Finance Minister and its Reserve Bank governor. These strings and secrete protocols undermined the new government’s ability to solve problems of poverty, joblessness, hunger , homelessness and AIDS. Financial, trade and monetary policies remained under the control of whites and foreign capitalist interests. These concessions assured South Africa’s admission into the World Trade Organization, but have left the people under a regime of economic apartheid and enduring poverty. Third, the ANC abandoned its right to control the nuclear technology and weapons given to the regime by the US, Britain and Israel. Six nuclear weapons were assembled by the 1990’s. Before the anticipated changeover to a majority-elected government, the South African government dismantled all of its nuclear weapons, the first nation in the world which voluntarily gave up all nuclear arms it had developed itself. This was a western decision to keep nuclear weapons and technology out of the hands of an African nation. Had this not been done South Africa would have been the only black government in the world with a nuclear weapons capacity. The significance of this is that nuclear weapons are a way of evening the playing field in global diplomacy. Fourth, agents of the regime assassinated Chris Hani, head of Umkonto we Sizwe and chairman of the Communist Party in 1993. At this point Govan Mbeki and the left wing of the ANC demanded an end to negotiations, reasoning that the ANC could not negotiate with a regime that murders its leading members. Mandela and his allies overrule them and insist upon continuing the negotiations. The significance of this is had negotiations been ended a new round of popular uprising would have begun and new more militant terms put on the table, including international prosecution of regime agents, rather than the Truth and Reconciliation process that occurred. Fifth, on March 17,2011 South Africa as a member of the UN Security Council supports a resolution put forward by the US, Britain and France allowing NATO to bomb Libya, eventually invade it and brutally assassinate its leader Muammar Gaddafi. The South African representative passionately argued in favor of the Western proposal. The significance of this is that it signaled a turn by South Africa in international relations to a pro Western imperialist posture, even turning its back on the ANC’s long time financial, political and military ally, Gadaffi. Sixth on August 16, 2012 the South African army, now commanded by Africans, fires upon demonstrating mine workers, killing 34, reminding the world of the 1960 Sharpeville Massacre. The difference this time is the murderers are black, just like the victims. This was a demonstration that the South African government would kill striking miners in defense of the economic interest of foreign mining companies. Neither the ANC, the South African Communist Party nor COSATU have condemned the killing. While the events after 1990 cannot all be attribute to Mandela and it is true that he did not wholeheartedly sign off on all the decisions made by the ANC government. Certainly by the mid 2000’s Mandela was no longer a part of the governing or political processes in his nation. However, from the late 1980’s when he began secrete negotiations with the regime and his signing off on an economic program of neo liberal capitalism that went against The Freedom Charter cannot be overlooked in any evaluation of Mandela last period. He became in most respects an enabler of the neo-colonization of South Africa and part of handing the nation and its economy over to the West. In the end, the question is not whether Mandela was a good, wise man and elegant man, he was all of these and perhaps more. Undeniably he sought racial peace and solidarity. Certainly Mandela was never a terrorist (a status the US government kept him in until 2008), he always sought to free his people from oppression, injustice and poverty. Moreover, he was always an exemplary human being, especially as he pursued revolutionary aims. The question of his legacy is whether he remained true to the revolutionary commitments he made early in his life, commitments for which he was imprisoned for 27 years. A concrete historical analysis of his life shows that at the end he faltered, lost his revolutionary resolve and either lost confidence in his people or ceased to recognize the possibilities inherent to struggle. Those of us who believe in freedom embrace, salute and uphold the revolutionary Mandela. At the same time we must unapologetically admit that Mandela died not as a revolutionary, but as a symbol of the system which oppresses his own people. A new generation of fighters is emerging as the nation grieves Mandela’s passing, they will I am sure return to the Mandela of the ANC Youth League, The Freedom Charter, Rivonia Trial, and Umkonto we Sizwe, to the revolutionary Mandela. And so the dialectics of resistance assert and reassert themselves as the struggle for freedom pushes forward. Long Live the Revolutionary Mandela. We humbly express our love and gratitude for your sacrifice and commitment.